This magnificent Gold Coast resort has it all! 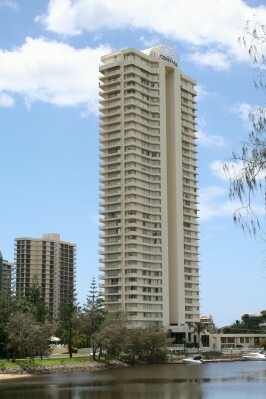 Contessa is ideally located next to the broad, white beaches and the blue Pacific Ocean on Gold Coasts Main Beach. It is only a short stroll to cosmopolitan Tedder Avenue, with its world class restaurants offering superb cuisines, alfresco dining and nightly entertainment; and exciting central Surfers Paradise is just a few minutes to the south. Relax in luxury in your own self contained apartment and soak up the ocean views and refreshing sea air. Contessa is set in a relaxing two acres of beautifully manicured, landscaped gardens; with a huge outdoor pool and spa; full-size tennis court; large indoor heated pool and spa; gymnasium; and sauna. For the boating enthusiast Contessa boasts its very own marina on the Nerang River and if motor racing is your passion Contessa is ideally located track-side for the Gold Coast Indy.